In those days the catch quotas were filled by any fishermen who wanted to fish and it was known as a “derby” fishery. The fishery would open by regulation just two times a year – for fishing for 24 or maybe 48 hours, depending on when the allocated pounds were caught. Crews were bleary-eyed and sleep-deprived, pulling the “butts” over the roller, gutting them, and then head-and-belly-icing the fish to try to keep them cold until they could be delivered to a processor. This 80s twice-a-year glut often led to careless handling of a potentially valuable commodity. Fish could sit for more than a week before moving on to the processor and into freezers. 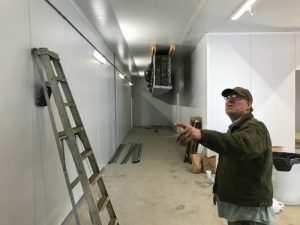 Prices were very low as the fresh markets were flooded, leaving the bulk of the catch frozen in warehouses for months until it was sold – severely degrading the quality and lowering the price of the fish. The economic potential of halibut remained untapped until 1992 – when a defining event happened in the industry: the institution of IFQs – the Pacific Halibut and Sablefish Individual Fishing Quota Program. 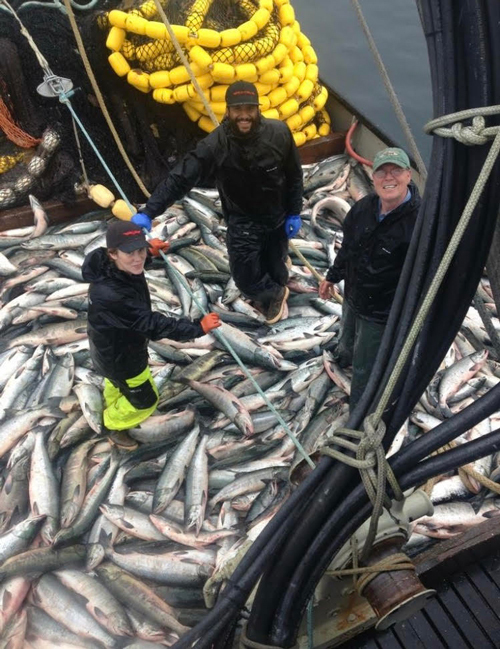 The IFQ Program limited the halibut and black cod fisheries to a specific number of participants, and the season greatly expanded. This allowed an even flow of fish on fresh and frozen markets and, thus, greatly improved the quality of the fish. These days halibut (and black cod – amazingly, now, considered a premium fish because of its high omega-3 content) constitute a relatively small share of the market – people want salmon! 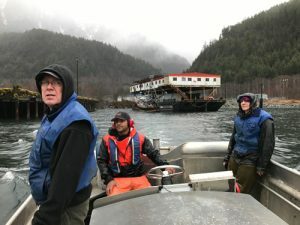 And history repeats itself – many of the same issues that affected halibut prices and markets in the 80s still occur today – in the Alaskan salmon fisheries. 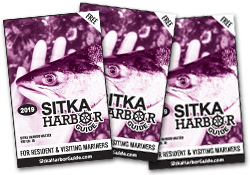 One local Sitka company, however, aims to improve that situation. 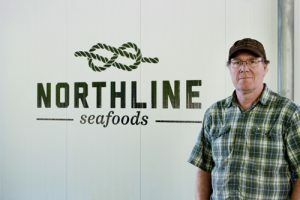 Pat Glaab is co-owner (with his partner Ben Blakey) of Northline Seafoods based here in Sitka. Glaab, who began working in Alaska fisheries in 1980, actually grew up in a rural farming community in Wisconsin where his father was a dairy veterinarian. 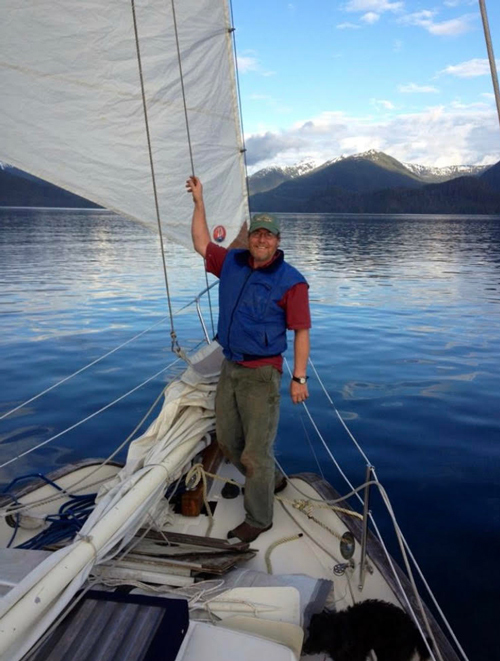 The young Glaab attended an unusual high school that required tuition, and he heard there was money to be made in Southeast Alaska fisheries, so he hitchhiked to Alaska, arriving in Sitka with one dollar in his pocket. He spent the next 14 years working for Sitka Sound Seafoods (SSS), then owned by the Thompson family. When the young mid-westerner found the adventure appealing, he took jobs – both on the slime line and elsewhere in the plant – and was able to fish a few halibut derbies as well. He co-managed the Port Alexander scow for 4 years (designing a large ice machine to improve the quality of the catch for trollers); spent a season redesigning the newly acquired SSS plant in Yakutat; and ran the company’s Dry Bay plant on the banks of the Alsek river for 4 years (designing an ice delivery system for the salmon set netters, dramatically improving the quality of their fish – and the price for fishermen). Glaab speaks fondly of Harold Thompson, then manager and co-owner of SSS. Harold Thompson, along with his father, Tommy, gets credit for Glaab’s learning and ultimate understanding of the management of the fish business. “I’ve always been spoiled to have had Harold Thompson as my boss. He was the best boss I ever had.” Glaab describes how Thompson encouraged him to acquire new skills and to explore his own ideas. Having spent the past 25 years managing, designing, and engineering multiple seafood processing plants throughout Alaska, Glaab uses the management style learned years ago today in his own company, Northline Seafoods. Glaab says he firmly believes the key – for consumers, fishermen and processors alike – lies in realizing the value of the fish – and not just wasting this tremendous resource. With the new fishing technology – depending on the level of quality desired – individual fish can, for example, be tracked to the vessel that caught them. These technological innovations help to cast the fish as the star of its own show and, thereby, spur consumer demand for quality. Markets are responding to this innovation as best they can, though they still struggle with inconsistency in the product from the Alaskan fishing industry as a whole. Glaab says Northline Seafoods is completely retrofitting a 130 foot-barge at the Gary Paxton Industrial Park for service in the Bristol Bay Sockeye salmon fishery for the 2019 season. The company will be focused on producing a very high quality product and maintaining that quality as the fish make their way to the market. The continuing emphasis on salmon quality and value is expected to net long-term positive results for fishermen and fish lovers alike. 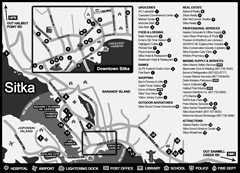 Will Swagel lived in Sitka for 36 years, from 1982 until his death on April 1, 2018. He wrote extensively about Alaskan issues in local, state, national and international publications, reported for KCAW-FM news, and was the author and publisher of The Bight Before Christmas. He loved to eat fish. Suzanne Portello & Will Swagel were married. They had been together for 43 years and were still married at the time of his death. Suzanne is a retired RN, manager & editor of the Sitka Soup, and also loves to eat fish (especially salmon). Chris Todd is married to Glaab, is retired and is a former reporter for KCAW-FM. We don’t know how she feels about fish.